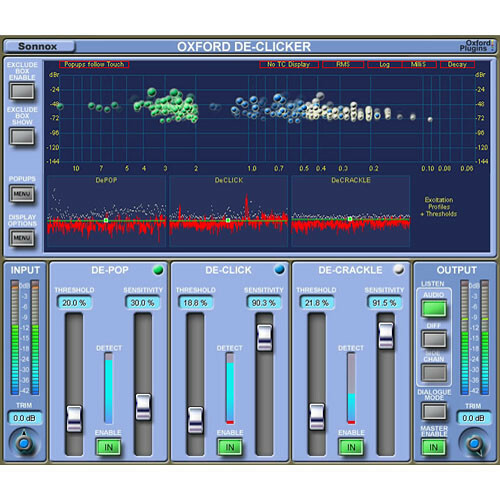 The Oxford DeClicker from Sonnox is a plug-in that removes short duration noise events from audio material using advanced algorithms that results in a high quality of repair. The plug-in features three main sections - DePop, DeClick and DeCrackle, with each sections dealing with events that are up to 10mS, 3mS and 0.4mS in duration respectively. Each of these sections has a threshold and sensitivity control, and an excitation profile which shows the residual signal left after harmonic content is removed. The excitation profile represents how much the signal deviates from the predicted signal. The threshold controls determine how many events are detected, and the sensitivity controls determine how many of those detected events go on to be repaired.